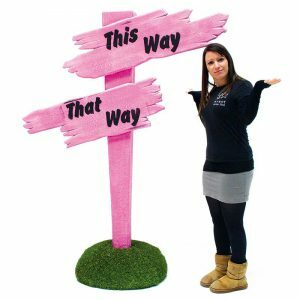 Our Nightclub theme prop hire section is the perfect place to find props which will help you create your very own private nightclub. Dance your way through the 70’s, 80’s 90’s & the 00’s and remember, you make the guest list, you pick the music, and you get to choose the closing time! 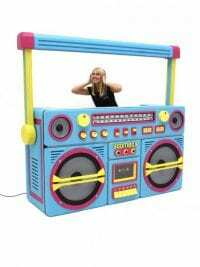 Giant Ghetto Blaster Prop to hire. We also have a neon blue ghetto blaster, both with and without lights. Check out all of our ghetto blaster options here. 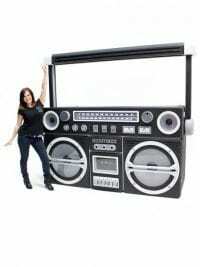 Take a look at this fabulous retro ghetto blaster. 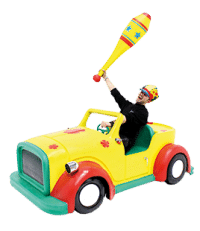 This prop is perfect for any 80's or 90's themed party and is extremely versatile as it can be used as a DJ stand or drinks bar, as well as simply a prop to help set the scene. For a ghetto blaster that can offer fantastic lighting effects (a strobe effect, colour changing or static colour) you can hire SN1184, our black version with lights, or we have a neon blue ghetto blaster both with and without lights Check all of our options out here. For a ghetto blaster that can offer fantastic lighting effects (a strobe effect, colour changing or static colour) you can hire SN1185, our neon blue version with lights, or we have a black ghetto blaster both with and without lights Check all of our options out here. 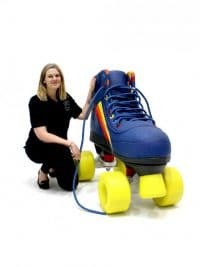 Giant Roller Boot to hire. 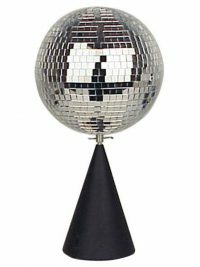 An iconic item from the disco era; this prop is perfect for any 70's or 80's themed event or party. 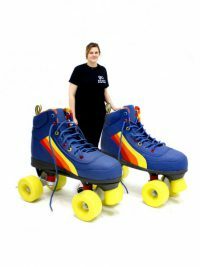 We have both the left and right giant roller boots so how about hiring both and positioning them either side of an entrance or a bar? Please note that the price quoted is for the hire of a single roller boot; you can hire the two together under prop code SN3469. Colour changing LED bar for hire. 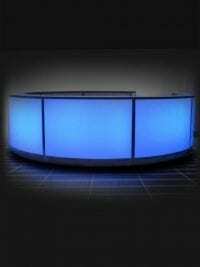 This is a stunning LED Colour Changing Bar; the perfect addition to any themed event! The bar has the ability to scroll, flash and fade through different colour combinations, or it can be set to any static colour, enhancing the atmosphere of your themed event. And, if you fancy a change of colour half way though your event then you can easily change the colour of the bar! This bar draws 700 watts of power – of particular importance to exhibition hall customers. We are also happy to offer clients the facility to brand the bar front panels with company logos etc. for a small additional charge; simply speak to a member of the sales team for further information. 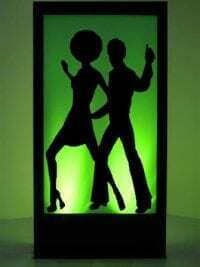 Silhouette panel depicting 70's disco dancers.All our silhouette panels come supplied with lighting. Lighting colour may vary from that shown. Spice Girls Silhouette Panel for hire. 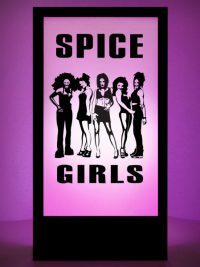 Modern day icons, the Spice Girls, are depicted in a classic pose in this fun silhouette panel; a perfect addition to any music or 90s themed event or party! Quality Star Cloth for Hire. Take a look at our LED Star Cloth, controlled by a single controller (supplied). 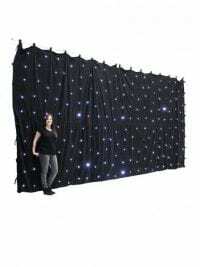 This Starcloth will add ‘star’ quality to your event or party, whether it is used behind a stage, DJ, or dance floor area. 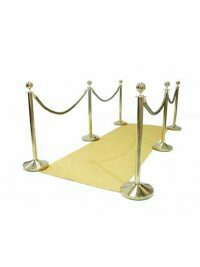 Our Star Cloth comes with a pole and drape system for hanging it as standard. Please note that the cloth must not be stapled to anything. 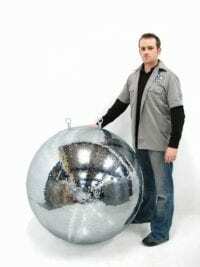 This disco mirror ball is perfect for any themed party or event, particularly a 70s disco, providing the classic effect that is and always has been an essential part of any dance venue! 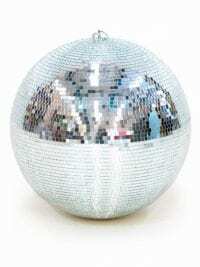 This mirror ball is shown off to its best effect if it is suspended (you will need to organise hanging this yourselves). All fixings to hang the Mirror ball are supplied. A motor is available as an additional extra; simply speak to a member of the sales team to discuss this. Please note that this product is delivered in a crate that you will need to store during your event. Mirror Ball Table Centre for hire. 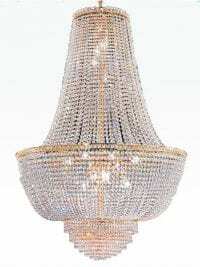 Add a touch of sparkle to your themed Disco or 70's themed event with our motorised revolving glitter ball table centre. 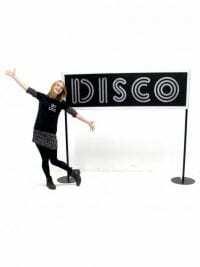 Our Disco Sign is a very simple but effective prop for your seventies party. 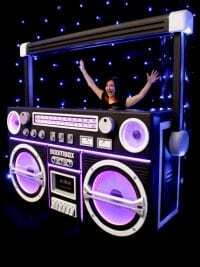 It can be hired on its own or with other props to create a true Disco feel for your event. 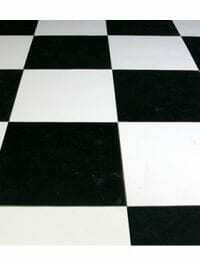 This is a high-quality black and white check dance floor with silver trim. The dance floor is supplied in a trolley (two trolleys for the 6m x 6m version) for easy transportation to/on site. 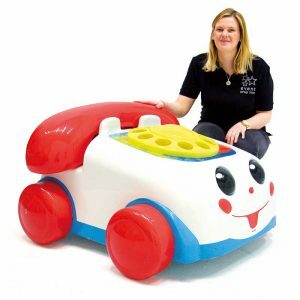 We usually supply the floor as DRY HIRE item but you can have the item installed by our amazing team upon request for a few extra pennies! The Dance floor can be supplied in 3 x different sizes to suit your venue space. Please specify the size you require at the point of ordering. 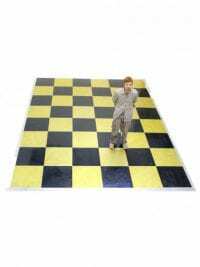 This is a high-quality Black and Gold checked dance floor with a silver trim. 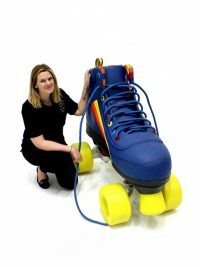 The dance floor is supplied in a trolley for easy transportation and is supplied as DRY HIRE as standard. 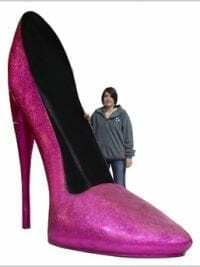 A fully sculpted three dimensional giant stiletto heel shoe which will serve as a great showpiece prop for your themed event. This shoe is a two piece construction giving great authenticity on a giant scale whilst ensuring easy installation! It is a freestanding, stable prop. Oversized Peep-Toe Shoe for hire. 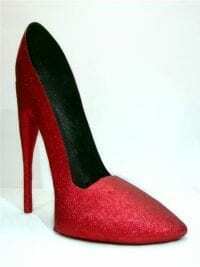 This freestanding, beautiful peep-toe shoe would look great at your themed event or party. 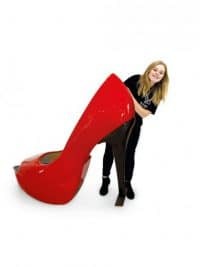 So, whether it is a Fairytale, James Bond or Fashion theme you're planning, our shoe is the perfect prop to really make a statement. We also have the right shoe so why not hire the pair?! 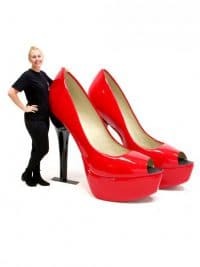 Oversized Pair of Peep-Toe Shoes for hire. These freestanding, beautiful peep-toe shoes would look great at your themed event or party. 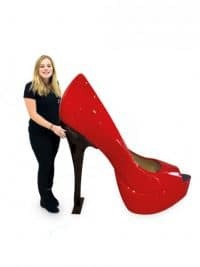 So, whether it is a Fairytale, James Bond or Fashion theme you're planning, our peep-toe shoes are the perfect prop to really make a statement. If space is an issue you can also just hire one shoe; see below. 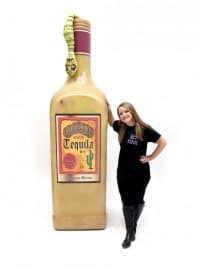 Giant Tequila Bottle prop to hire with detachable worm! Perfect for any Wild West Western Cowboy themed event or Mexican themed event. 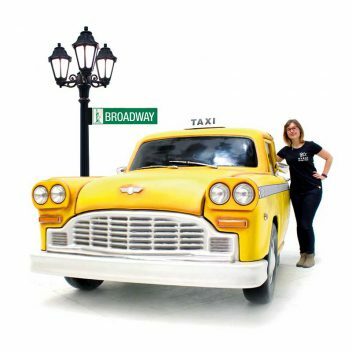 This prop is fully 3D and freestanding and will certainly add the wow factor to your event. Sadly, this prop does not contain real tequila! 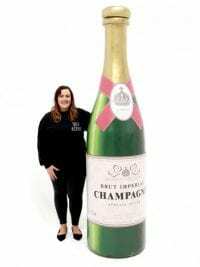 Giant Champagne Bottle Prop to hire. 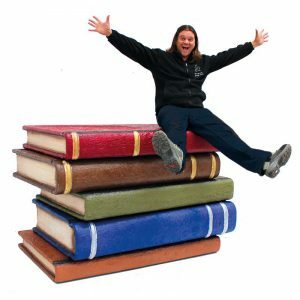 This prop is fantastic and makes a real statement whatever you are celebrating! The bottle is big and bold and will really set the atmosphere for your party. Please note that the hire price quoted is for the Champagne Bottle only; all other items pictured opposite are available to hire separately. Kick back and relax with a cocktail, but not just any old cocktail…how about our GIANT Blue Lagoon Cocktail; a must for any cocktail connoisseur! 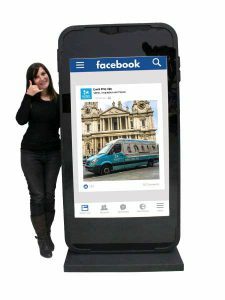 This is the perfect prop for many themed events, from Nighclub to Festival, or how about for your seaside or holiday related event or party? 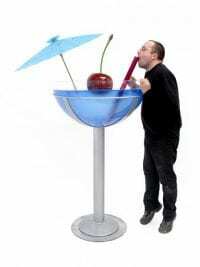 Complete with giant replica cherry, drinks straw and cocktail umbrella (colours may vary), our Blue Lagoon Cocktail is freestanding and weighted for stability. 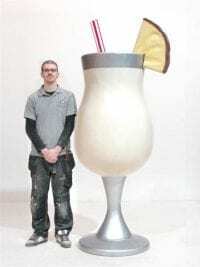 Giant Pina Colada cocktail prop to hire. 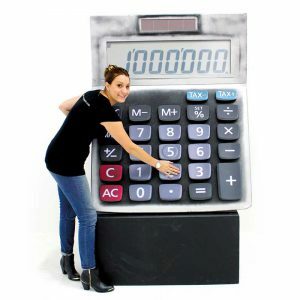 This prop is perfect for any 80's themed event party and will add a real wow inpact to your event theming and decoration. 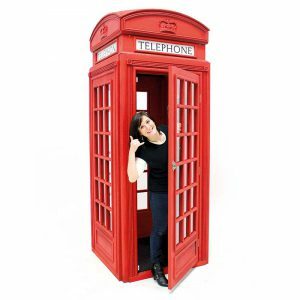 You too can be just like Del Boy with this freestanding prop. 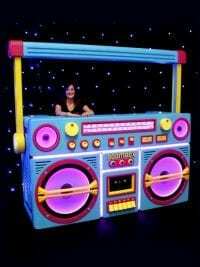 This & all our other 80's themed props to hire will make great additons to any 80's themed party event. 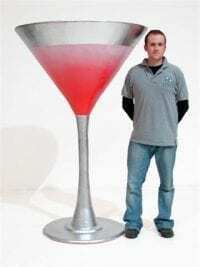 Giant Cosmopolitan Drink Prop to hire. Burlesque Dancers Martini Glass for hire. 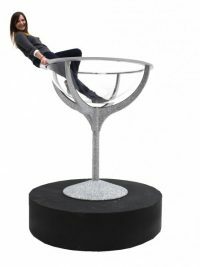 This beautiful silver glittered giant Martini Glass has been re-designed and we think you will agree, it looks stunning. Our Burlesque Martini Glass is perfect either for display or for a Burlesque dancer to perform in at your themed event and as such is weighted for stability beneath its circular wooden black base. 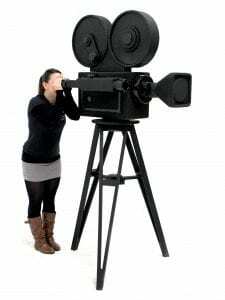 Full instructions for its set up will be provided (ladder required). Please note that we do not provide ladders for you to access our martini glass. Also, you cannot wear shoes in this glass or place any sharp objects inside as this will scratch the acrylic hemisphere. Also, the prop will come in several large boxes which you will need to store for the duration of the event. 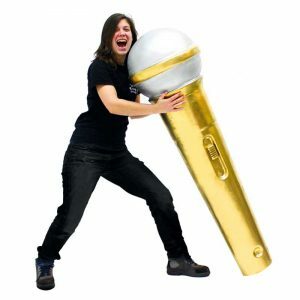 PLEASE NOTE THAT THIS IS A HIRE PROP ONLY AND WE DO NOT SELL THESE. Giant Headphones prop to hire. 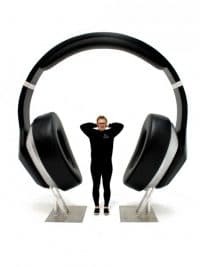 These giant replica headphones are fantastic and will be perfect for any Music or Urban/Street themed event or party. Giant Champagne Cork Stool available to hire! This fabulous oversized Champagne cork seat is perfect for your celebratory themed event – cheers! 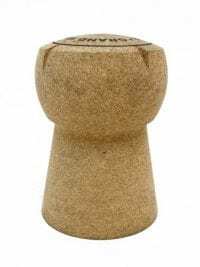 Made from real Cork, these stools would help create an eye catching break out seating area. We also have a Champagne Cork Wire Table and how about our Giant Champagne Bottle (both pictured opposite)! 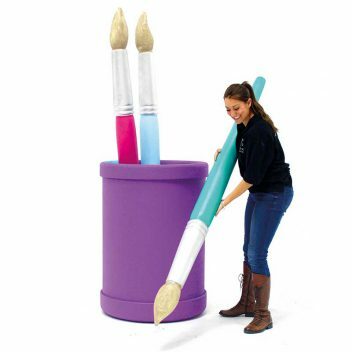 Please note that the hire price quoted is for the cork stool only; all other items are available to hire separately. Giant Dancer's Cage to Hire. This is a cast iron welded cage, complete with plinth, and is perfect to hire for any Medieval or Halloween themed event. There is a lockable door allowing entrance/exit into the cage for any dancer (or prisoner!). Please note that the base for the cage is now circular. 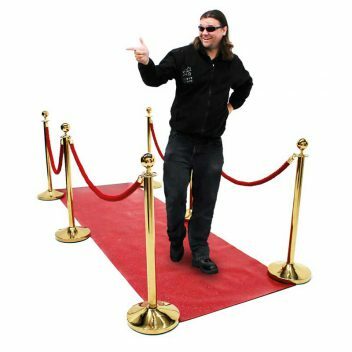 Welcome your guests inside in style with our luxurious gold carpet walkway for hire. Consisting of gold coloured carpet and six gold stands, our standard price quoted is for a carpet length of 5 metres, but we can supply different lengths upon request at a small additional charge. Please call to discuss! 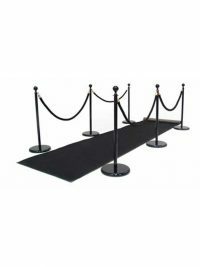 The black carpet is supplied with six black stanchions and four black ropes. Our standard length is 5 metres but we can supply different lengths upon request. 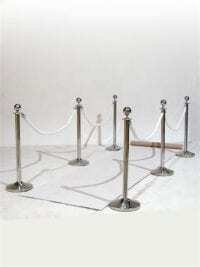 We can also supply different coloured stanchions; simply call to discuss! White Carpet Walkway to hire. 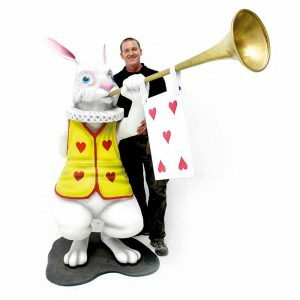 Consisting of a 5m length by 1m wide white carpet with 6 silver stands and 4 white ropes is perfect prop hire for any Winter Wonderland themed event party.